As early as 1919 the Connecticut Department of Transportation recognized the need for an alternate road to Route 1 (also known as the Boston Post Road) through Fairfield County. Many of the county’s residents lobbied for a “parallel post road” which would divert high-speed passenger traffic away from Route 1. In 1925 Governor Wilbur Cross endorsed the proposal, and two years later legislation was passed to build a new road from Bridgeport to Greenwich. An appropriation of $1 million was approved in 1931 and the Merritt Highway Commission was formed. The highway was named after Congressman Schuyler Merritt who pushed for the beautification of the area. The road was to be built with entrance and exit ramps similar to today’s highways; however, this was a relatively innovative idea for the 1930s. It also included a well-landscaped parkway in order to make the drive more pleasing to the eye. Construction began in 1934, but they shortly discovered that the funds appropriated would not be enough to complete the project. So in 1935, the legislature granted Fairfield County authority to issue $15 million in bonds to finish the highway. The first section of the highway, from the New York State line to Norwalk, opened on June 29, 1939. 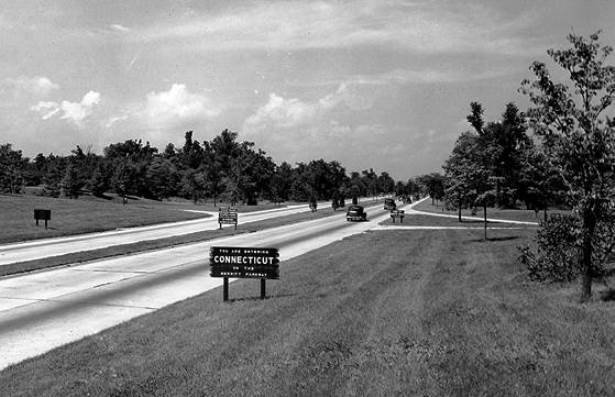 The entire length of the highway was formally opened on Labor Day, 1940, as Connecticut’s first parkway. Today the road is named as a State Scenic Road, and is on the National Register of Historic Places.